The Mojave Desert is a beautiful, magical place. We are building this destination because we realize how hectic life has become. We live it, we know. We wanted a place like our parents took us when we were kids. 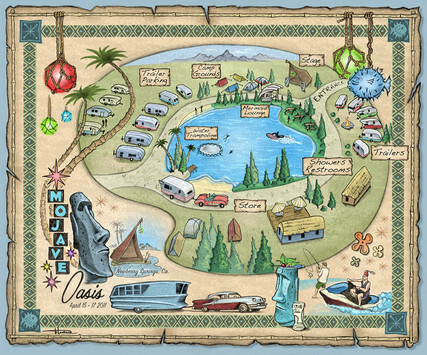 The Mojave Oasis is a private club, for friends & groups to come, Have fun, Relax, Travel like families did in the 60's. It's a fun place where you can Swim, Read a Book, BBQ or do Nothing at all. Thank You for Visiting! Webster says an Oasis is - An isolated, fertile tract or green, locality in a desert region, made so by the presence of water. I think that covers it! I'm gonna cast my vote for Mojave! While I appreciate the lengths the Hotel folks go through to make us feel welcome and don't interfere with the fun we're having, when you get down to it, it's just another hotel, and I can stay in a hotel anytime. Mojave Oasis is a special place, and Queen K constructed it all with us in mind: we don't have to "bring the tiki" - it's already there waiting for us! I've been there for every tiki event so far, and ANY opportunity to go to Mojave again gets priority in my book!